PITTSBURGH, PA and CENTURION, SOUTH AFRICA--(Marketwired - Jul 12, 2016) - Aquion Energy, Inc., manufacturer of Aqueous Hybrid Ion (AHI™) batteries and energy storage systems, and SolarAfrica, a leading African Solar Energy Services Company, today announced a newly installed off-grid microgrid at the Loisaba Conservancy, which is a hub for wildlife research and a world-class ecotourism destination in Kenya, East Africa. 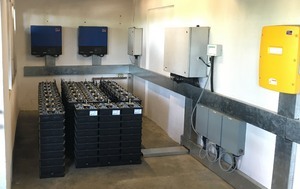 The microgrid, which was funded, designed, installed, and integrated by SolarAfrica, consists of two independent systems, each of which has 106 kWh of Aquion batteries paired with a 37 kW solar array. This off-grid solar-plus-storage system has replaced diesel generators to power a commercial laundry, swimming pool, kitchen, business services, lighting, cooling, and other facility loads. "Loisaba comprises 56,000 acres of pristine lands, populated by hundreds of animal species and enjoyed by thousands of visitors and guests each year," said Tom Silvester, CEO of the Loisaba Conservancy. "We embrace the idea of living lightly on the earth, minimizing our carbon footprint and maintaining a clean, safe, and sustainable environment. The use of Aquion saltwater batteries in tandem with SolarAfrica's solar powered solutions is perfectly aligned with our approach to preserving nature, enabling us to generate power from the sun and store it for later use." Lodges that are located off-grid have traditionally used diesel generators, often in combination with lead-acid batteries, which are known for their toxicity and relatively short lifespan under deep cycling and partial state of charge usage. Aquion's Aspen batteries offer a clean, sustainable, and long-lasting alternative which can operate at high ambient temperatures and does not degrade from partial state of charge cycling. Aspen batteries have a unique and environmentally friendly electrochemical design, and are the first and only batteries in the world to be Cradle to Cradle Certified™. Dr. Kobus van Tonder, Project Manager of SolarAfrica, mentioned that there were several highlights of this project for him and his team: "The outcome of this project has made many significant changes to the way we use energy and how we perceive it. We noticed how the lodge quickly descended into a blissfully quiet state, as the constant humming of generators were turned off. Another great benefit of switching to solar energy, and storing it effectively, is that it's now significantly cheaper than running diesel generators, which also means that the consumption of diesel decreases, as does the carbon footprint." Van Tonder concluded by saying, "Battery technology is constantly evolving. This project created a lot of interest amongst the tour operators and investors alike. Aquion's batteries are low maintenance compared to other storage products in the industry, and they removed the typical need for cooling, air-conditioning, and special ventilation." "Thanks to the Aquion batteries and the solar power system, Loisaba expects to reduce diesel consumption by 95% and save 53 tons of CO2 per year. Due to their safe, robust, and environmentally friendly chemistry, Aquion batteries, in combination with solar power, provide optimal performance in this challenging off-grid location," said Tim Poor, Chief Commercial Office of Aquion Energy. Aquion Energy is the manufacturer of proprietary Aqueous Hybrid Ion (AHI™) batteries and battery systems for long-duration stationary energy storage applications. Aquion's Aspen line of batteries are optimized for daily deep cycling for residential solar, green architecture, off-grid and microgrid, energy management, and grid-scale applications. Aquion's high-performance, safe, sustainable and cost-effective batteries deliver reliability and value for customers. The company's battery systems provide flexible, modular energy storage that enables broad adoption of renewable energy technologies such as wind and solar, reduced reliance on fossil fuels, and optimization of existing grid-tied generation assets. For more information, visit aquionenergy.com. Launched in 2011 as NVI Energy and rebranded in 2015, SolarAfrica is a leading African Solar Energy Services Company. Working with an approved partner network, SolarAfrica offers solar energy solutions to commercial, industrial and residential energy users. We partner with solar installers, EPC contractors and developers, who source, install, service and/or operate these solar systems. We specialise in bringing together financial and technical know-how to offer the full spectrum of solar services whilst providing our growing partner network access to alternative fully paid-for solar energy offers. While the cost of solar continues to decrease, the cost of grid energy continues to rise incrementally. SolarAfrica has grown its offering from off-grid, to urban grid-tied customers in several countries across the African continent. Today, the company offers solutions in South Africa, East Africa and soon to be in West Africa. Together with its technical partner network, SolarAfrica continues to look for new and innovative methods to save our customers money and adopt clean, green energy technology by switching to solar. Loisaba is a 56,000-acre wildlife conservancy and working ranch located in Northern Laikipia, Kenya, Africa. Two permanent rivers and abundant permanent springs make Loisaba attractive to wildlife throughout the year. The Loisaba mission is to protect and enhance critical wildlife diversity, abundance and habitat in the landscape while concurrently supporting sustainable livestock production and improving the lives of neighboring communities. The conservancy is a haven for more than 260 species of birds and 50 species of mammal. Alongside the more common wildlife are over 800 elephants who roam across Loisaba; large herds of buffalo; dozens of endangered Grevys Zebras, reticulated giraffes and the beautiful Greater Kudu; three prides of lions and numerous leopards and cheetahs. The Loisaba Conservancy is made possible by supporting partners including the Elewana Collection of Camps, Lodges and Hotels which deliver an experience that results in lifelong memories and an ever-lasting love for Africa, and the Nature Conservancy which is the leading conservation organization working around the world to protect ecologically important lands and waters for nature and people.